Crispy Snippets | So yeah, chickens, cats, horses and stuff… you know… stuff. Hello again and welcome. Here is a brief update on things occurring with us here in the Black household. It was a very warm Autumn, then a strange winter with not much rain, not very much snow (boo!!) and now we have rain. Lots and lots of rain. Being in drought of course means, that all this rain is just sitting on the surface and we need an awful lot more for it to actually soak in and make a difference. But until that happens, we have mud…. lots of mud. Our hens are very lucky and have a lovely covered pen to stay in when the weather is really nasty. I and they don’t like being out in a howling gale and I think it’s just safer if they stay undercover. They have a solid nylon roof with clear plastic sheets around the outside, so they can still see out but the weather can’t come in. The doors are left uncovered with just the chicken (sort of) wire, so there is plenty of room for air to circulate. Being protected like this, means our girls always have some dry soil to roll in and some dry land to stand on! But thanks to this deluge of rain (lucky, as we have a hosepipe ban currently) my plants have been doing very well! Only this morning, I picked 8 lovely radishes from the veg patch. I don’t think it’ll be too long till some more are ready. The gooseberry bush is bursting into life and the new grass seeds I planted for the girls have produced a lovey lot of grass for them. Their eggs are amazing when they’re out on the grass all the time and it makes them even happier! We only have 6 hens now, after the sad death of Mel. I’ll do her a whole post when I can, but it still upsets me to think about it. She was a hen in a million. A huge gap has been left behind, but the others now seems to be OK. Crispy was a bit depressed for a few days after Mel died, but she seems back to normal now. Here are some of the girls in their usual place, camped outside the cat flap. Just to remind me that they are staving to death and require feeding constantly. Bonnie and I, have been having lots of fun too. Mostly dodging rain storms but we’ve built up our bond together and really trust each other now. She’s amazing and she loves to work. I think her worst nightmare is standing around doing nothing! Although when she starts yawning when you’re tacking her up, it can be hard to believe! This is us at our second dressage competition. She was much better behaved and a lot more relaxed than the first time. We got 62% which wasn’t quite good enough to be placed (first place got 80% and then second & third were in the 70’s) but I’m very pleased with her. 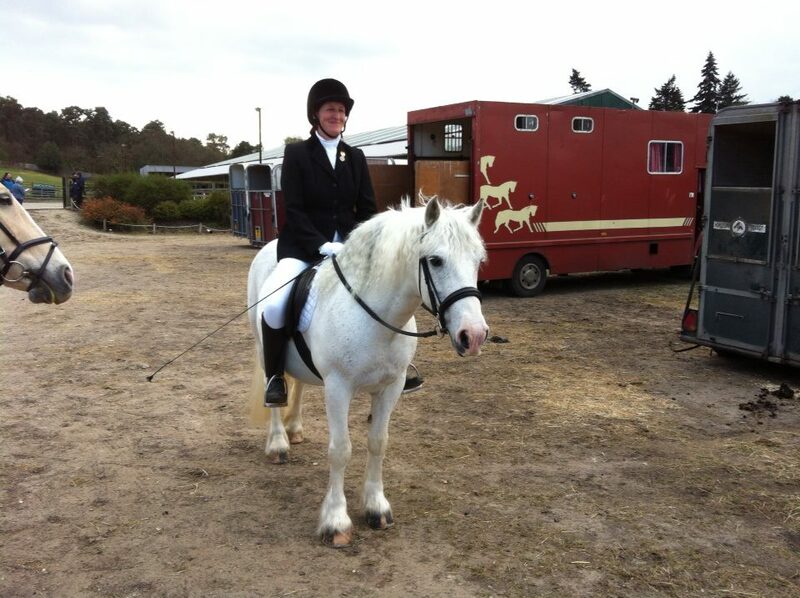 Here is Bonnie and me at a riding club dressage competition. 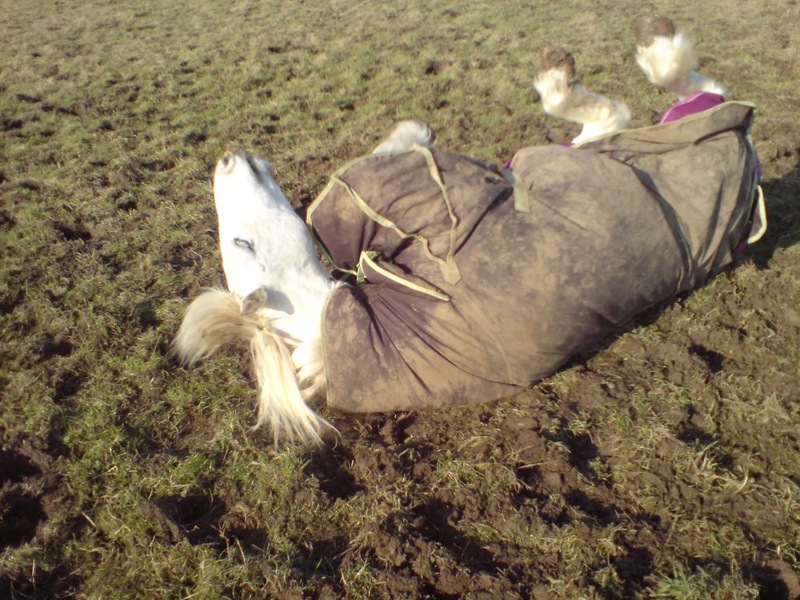 My pony is also feeling the spring time and has been having lots of ‘fun’ when we’ve gone out for hacks. She likes to decide when she wants to ‘canter’ and does often try to run off when she thinks it’s time….. she’s a lot better than she used to be. I started off by trying her in a pelham (which her owner said she’d been ridden in before) but as she’s only strong occasionally, I found it too much. So, I tried her in a Waterford snaffle. Amazing, I love this bit, she loves this bit and I can stop her running off! They may look a bit scary but in sympathetic hands, it’s perfect. Not really suitable for schooling, in my opinion, as it doesn’t really allow for a consistent contact, but as a ‘don’t lean on me and run off’ prevention whilst hacking/jumping, it’s perfect. I still school her in either a loose ring snaffle with a copper lozenge or if we’re out doing dressage, she has a hanging cheek snaffle with a copper lozenge. She has a very large mouth with a large tongue and so she seems to find the copper lozenge more comfortable than a plain french link. I’m hoping to get her out to do some jumping, but with the weather as it has been, the ground is much too slippery and the last thing I want is an injured pony. Frank (the Land Rover) is running very well at the moment. He now has a radiator muff on (with an open flap as it’s not winter). Not only does it look very smart, but it seems to help him get up to temperature more quickly and stops him cooling down quickly. Frank is still proving to be worth his weight in gold, super reliable, sturdy, straight and just all round awesome. I never want another car and hopefully, I’ll never have to have one! The cats are all fine. They’re all in their summer coats now (judging by the state of the carpets…) and all looking very well & content. Poppy has settled right in and has her own space to sleep in. There is still a bit of tension between her and Miew but nothing more than he gives our other female cat, Spice. Our son is just about to have his 6th birthday. I can’t believe how quickly all that time has gone. It doesn’t seem that long ago, he was small enough to cradle with one arm, now, he’s more than half the height of me and I’m 6ft tall!!! So all is well here. I hope everyone is enjoying the spring. Remember, we need the rain, really we do!! Well, it finally happened. In November 2011 I got my first pony!! Yay! After almost 25 years of riding and working with horses, I finally have one to call my own! It may seem unlikely on the surface but I couldn’t be happier. You may remember a few posts ago I wrote about a horse we had in for sale at the yard I work at, well, this is her. Her name is Bonnie, she’s a 14.1hh Highland pony and she’s 15 years old this year. We had a few people try her out, but she’s so darn clever, she would figure them out straight away. She’s an angel really, she just has a sense of humour which needs to be appreciated….. I have always enjoyed riding her and found her antics amusing. So after a few people came to try her, the previous owner couldn’t keep her anymore, so after a small begging session to my husband she became mine. When she first came to us to be brought back into work, as she’d not been ridden for about 18 months, she weighed almost 500kgs!!! Which is a disgusting weight for a 14.1hh pony! So after careful exercise and feeding, she now weighs a slender 420kgs…. still has another 20kgs to lose, as she’s still a bit cuddly! 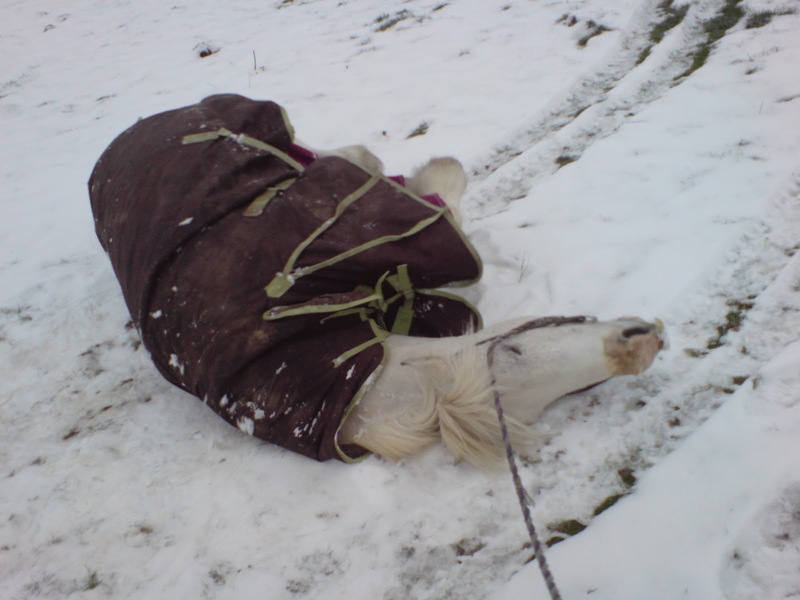 She is the opposite of anything I ever would have looked for… grey….a mare…. and under 17hh!! I’m 6ft tall, so it seems a bit odd having a 14.1hh right? Being a Highland pony, she is, well, built! She has huge shoulders and there is as much in front of the saddle as my friends Clydesdale cross! Highland ponies were originally bred to carry fully grown men and dead deer down from the hills… they are said to be able to carry up to 20 stones!! Thankfully I weigh nothing near that, but you get my point. She’s as light as a feather on the hand until she wants to mess about or gets startled, then she pulls like a train. She is led in a chifney. 9 out of 10 times she doesn’t do anything, but when she wants to go, even in the chifney, there really isn’t much you can do about it!! Thankfully though, she has a kind heart, and now, the only time I have any of those troubles is when something spooks her. 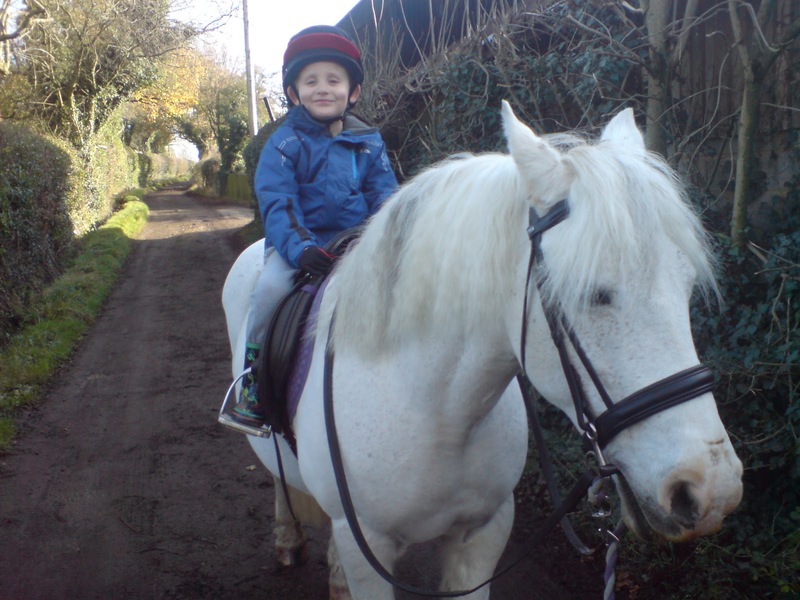 This is my 5 year old son riding Bonnie. She does a wonderful job of looking after him and has been a total angel. She even does that lovely slow trot you want for little ones! It’s a good job he’s tall though, as she is rather wide!!! The biggest job of course, as with any grey horse, is keeping her clean. She does love to roll in mud and sometimes, as my son points out, resembles a hippo…. Here is Bonnie doing what Bonnie loves doing best…. rolling…. she loves being covered in filth. 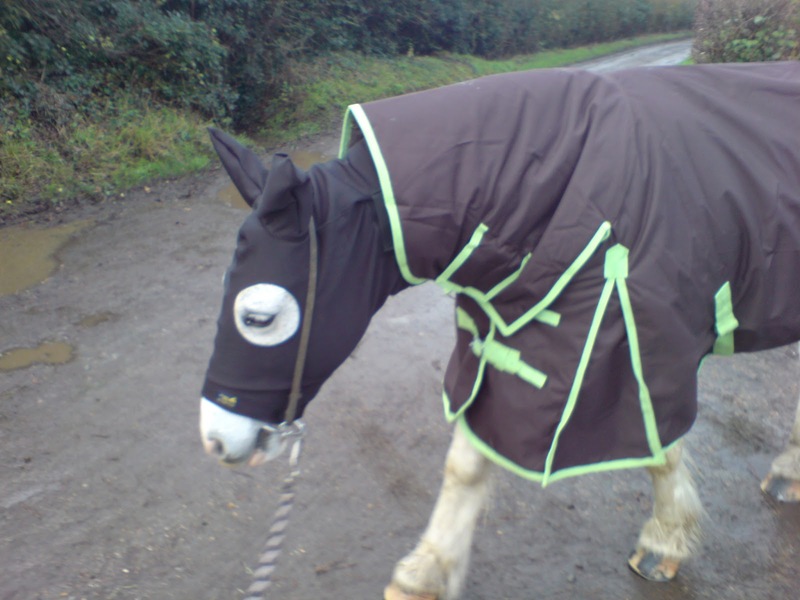 Here she is with her Snuggy Hood… not impressed really, but it was worth a try. I did try a smaller one, but it still slipped. I tried her with a Snuggy Hood but they just kept slipping and to be honest, the consequences of that are just not worth it. 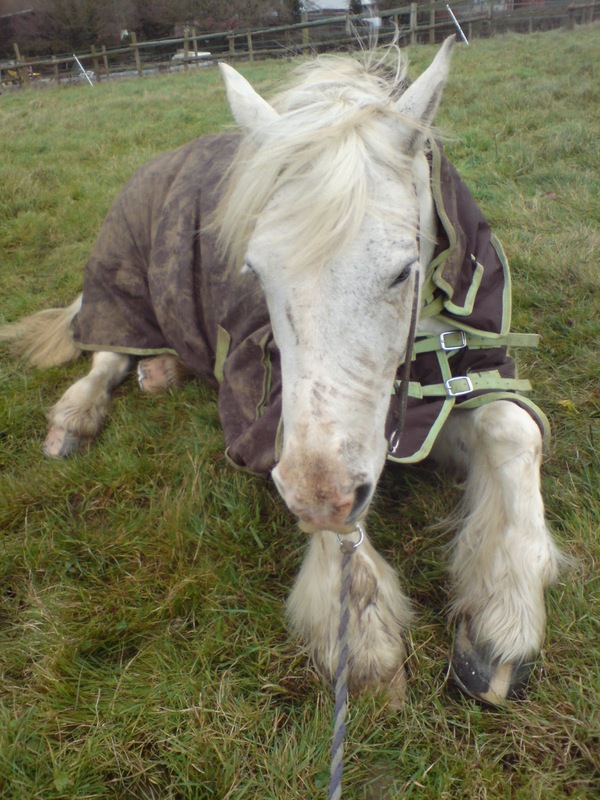 I’d rather have a filthy pony then an injured or dead one. Oh look! Another rolling picture!! In this one, she just couldn’t wait to get into the field before rolling, it’s a good job I have a lovely long lead rope for her!! So, it’s turned out well, she’s safe for my son to have a walk round on, although I wouldn’t let go of her!! LOL!! She’s also proving to be pretty darn good and is picking everything up very quickly. We have our first dressage competition in March, which I’m really looking forward to. We’re doing Prelim 7, which I thought would be a nice one to start with. I have competed before, but not for a long time and of course on other peoples horses…. Today, I thought it was time to clear the garden ready for autumn/winter. I reckon it’s going to be an early frost and a hard winter. My sunflowers were pretty much done, so I pulled them all down and collected the seeds. Then I started raking the vegetable patch. No sooner than the rake came out of the shed, my feet were surrounded by 8 clucking worm freaks. Everywhere I went, they followed. I even ended up with a cat trying to help too, although she prefers to provide vocal support and stay out of the hens reach! Here is V8 scratching at a sunflower stalk. These were big sunflowers, didn’t measure them but they were easily about 15ft tall….. The girls weren’t fussed about the seeds last year, but this year, they were quite enjoying having a munch. I took all the seeds I wanted for next years sunflowers and left the rest in the flower heads for the girls to have a play with. This is Spice, AKA Wench, Trout, Techni-colour Tramp…. she has many names. When we first got her as a one year old, she hid under the table for days…. but now, she never shuts up meow, meow, meow….. she is lovely though. She was very sick…. and she’s never been quite the same since, but she looks a lot better than last year! Anyway, this is the cat escape shelf, my husband put up…. they sit here (we have 3 cats) and watch the hens from a safe distance. If any cat should be so silly as to go near a hen, then all 8 hens chase the cats down the garden….. The hens seem to like chasing our 2 black male cats best…..
Back to the girls…. here they are sorting through the seed heads, leaves and sticks I’ve raked into a pile at the end of the garden. A good thing to remember when you have hens, is a pile is like a magnet…. they will stand on top of the pile and scratch it all over the place…. They don’t seem interested in this stuff until it’s in a pile….. Here are Ginger (front and well…. ginger) and Crispy at the back. They are sorting through the pile of earth I’ve just swept off of the path. I have to do this everyday. They all like to go in the ‘flower’ bed and dig all the compost out onto the path, I sweep it up, put it back in the ‘flower’ bed and then they dig it out again. Good fun! Here are 7 of our 8 ex-battery hens digging and scratching about. The one missing in this photo is Mel, who had gone to check out the cloche. Here is Chicken 22 in her ‘petrified hen’ pose. She’s actually very friendly, a bit nervous but she always looks terrified!! She does make me chuckle! Her bald patch on her neck is growing back and I think she looks great considering she only came out of the battery farm in July! Here are our 2 remaining original girls. 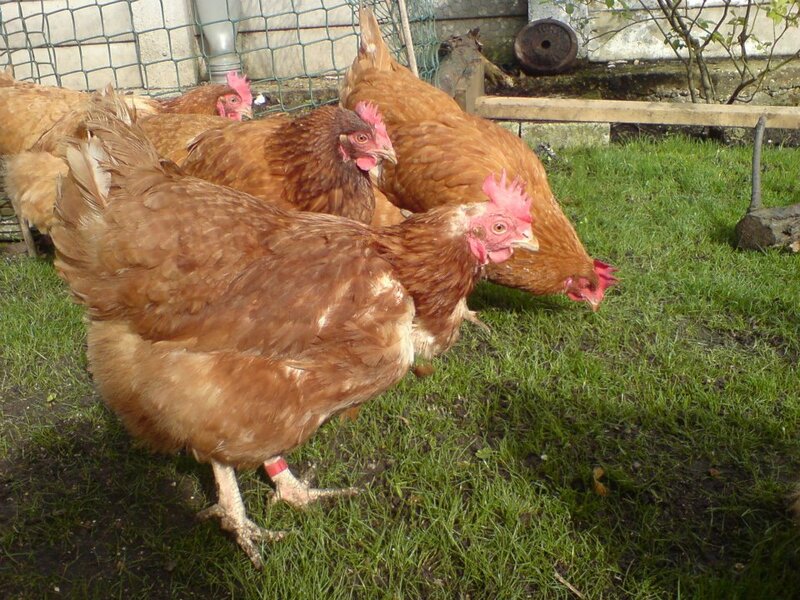 We got these ladies in July 2010 with 2 others (Chicken 11 and Terri). When we got these girls they were about 18 months old, so now they must be getting pretty close to being 3! Hens live to about 10 years. With battery hens though, they’ve been through so much already, been made to lay loads of eggs, so it can be hard to say how long they’ll live for. They are with us until the end. They are pets and an important part of our family. I have been asked if we eat the hens that die. The answer is no, they are buried in the ‘flower bed’. This is their retirement home after an awful life and they deserve to be treated with love respect, especially after what people have put them through for the sake of mass production. Yesterday, I took the rest of the beetroots and carrots out of the vegetable patch. I’ve had it fenced off since spring and our newer girls (Chicken 22, Bunty and V8) have never been in there. Last autumn, our other girls had a great time digging it over for worms and rolling in the compost. Hen heaven. So, today, just before I let them out, I took the fence down so the girls could go and have some fun. Here is Bunty in the courgette plant….. she’s managed to squeeze in here a couple of times, but this is her first legal outing into the veg patch. Her is Chicken 22 in her classic ‘petrified’ pose. She is named after Chicken 11 who had the exact same look about her! 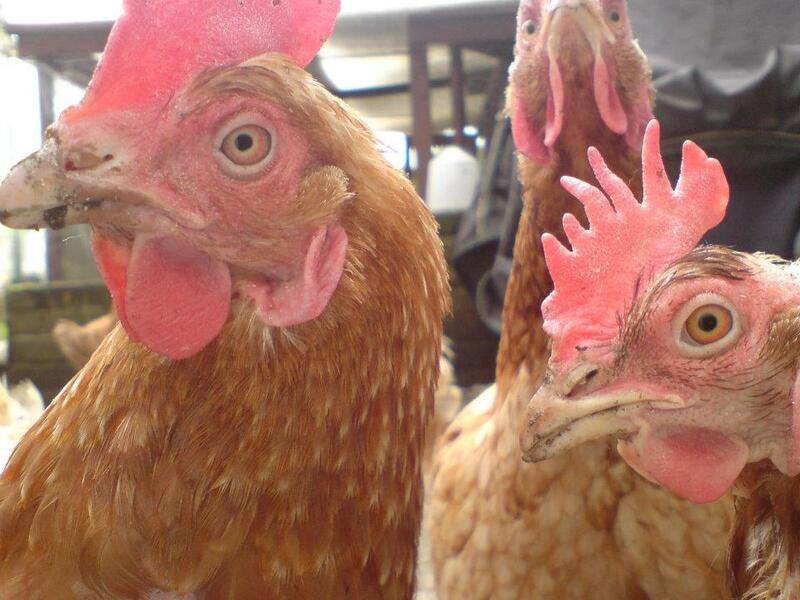 Here is Chicken 22 in the same place and pose, but Ginger is stood in front of her now…. she is a funny girl. Here is 22 (hiding behind a leaf in the top left corner), Bunty, Terri 2, Turbo and Ginger all having fun in the vegetable patch. Ok, so 22 is still hiding in the top left corner, Terri 2 is next to her, then V8 and Bunty together in the middle and then Ginger’s bottom in the bottom left corner. I’m convinced there are still some carrots in the ground, so I’m hoping the girls will dig them up for me…. They are wonderful rotivators and they also fertilize the ground as they go! Some sunflowers crept into the veg patch this year…. they were huge! I’m convinced that it was due to hen poo. As everyone in the UK knows, the weather has been pretty rough, and still is in some places. On Monday, we had the high wind and even in our sheltered garden, it took it’s toll. I didn’t let them out of the pen to start with, as with the horrible rain and wind, I was worried they might get blown away. But later on, as the rain died down and the sun threatened to come out, I let them out to survey the damage. So here are the hens tucking into the seeds from the sunflowers…. I was drying the heads out so I could harvest the seeds, but I guess I have more sunflowers…. In front with the purple leg ring is Crispy, just behind her is Bunty. Here are most of them, all crowded round, munching seeds. From left to right: Turbo, Crispy, Mel, Chicken 22, Bunty and Terri 2 right at the back! The missing ladies from here is V8 and Ginger. So here is V8 all on her own. She’s a funny lady, a bit shy, but very curious…. she’ll quite often do a great eagle noise impression whilst I clean them out…. She lays brown speckled eggs and she always lays them in the same place. She’s very friendly, and is very well feathered considering she only came out of the battery farm in July. Here is Chicken 22, named in memory of Chicken 11 who sadly passed away in the spring….. I still miss her, but this lady is just like her! 22 is lot bigger than 11 but she has that same crazy look about her and the floppy comb…..
22 is quite nervous and is the bottom ranking hen, she’s become much friendlier and doesn’t seem to be as worried anymore. So, back to the sunflower massacre…. 22 is in the front, with her typical startled face, then Crispy, with her concentrating face. Mel is just behind Crispy’s tail and Terri 2 is on the other side of the plant, mid-blink! I do believe that is Turbo’s neck in the bottom left corner. Here is another picture of the ladies having a munch. Ginger is in the middle with the pink leg ring, Terri 2 is on the left with the green leg ring and Crispy is still in best place with her purple leg ring. You can tell that Crispy is the boss here, even though Mel is in overall command, Crispy is the right hand ‘bird’ and does Mel’s dirty work…..
Ginger has the biggest, puffiest tail out of all of the hens. When we first got her, she didn’t have many feathers but her tail was huge!! She was terrible trouble to start with, a real bully….. but once she settled and stopped trying to beat everyone up, she turned out to be a really lovely hen. Here is Ginger when we first got her. In this picture she is actually facing up to herself in the mirror….. she was a bully and thought she should be the boss. When we first let her in with the other hens, she tried to take on all three of our existing hens at the same time!! I don’t think any hen or person had ever been nice to her and she felt like she had to fight for everything….. poor girl. Now, she’s very easy going, happy to be picked up and will sit on your lap for a cuddle….. The sunflower is still laying on the lawn, the girls don’t seem to have finished with it yet…. maybe I’ll leave it there just a bit longer.